Who’s been to a writers conference this year?? Me, listening to you talk about your writing conferences. Sorry. I’ll compose myself. But seriously, after attending DFWCon in April 2016, I’ve been itching to book another conference. There were a lot of options for me in 2017: the Writers Digest one in NYC, SCBWI in LA, maybe DFWCon again? My mind whirled. As a past resident of Denver, this appealed to me. I love the Mile High City, and I’m familiar with the location… my sister actually used to live five minutes from the conference hotel! Plus, and here’s the big reason: Kristin Nelson is attending. If you’ve been following my blog, you know how much I idolize her. I’ve participated in two of her Query Letter Intensive workshops, and have been a religious reader of her blog for at least five years. She’s an awesome agent and an even cooler person, so the fact that I’ll get to meet her face-to-face is huge. The day conference registration opened, I signed up. But wow, that was a confusing couple of hours. There were so many options–character development workshops, one-on-one pitch sessions, first page critiques, round-tables with your favorite agents and editors, coffee with published authors… Choosing my schedule was the hardest part. I needed a freaking time-turner to hit everything, and sadly, I’m not Hermione. I picked my favorites. Half of my paid-for activities include someone at the Nelson Literary Agency, because of course they do. And the writing, because I definitely want a shiny new manuscript to pitch at this conference. I can’t wait! 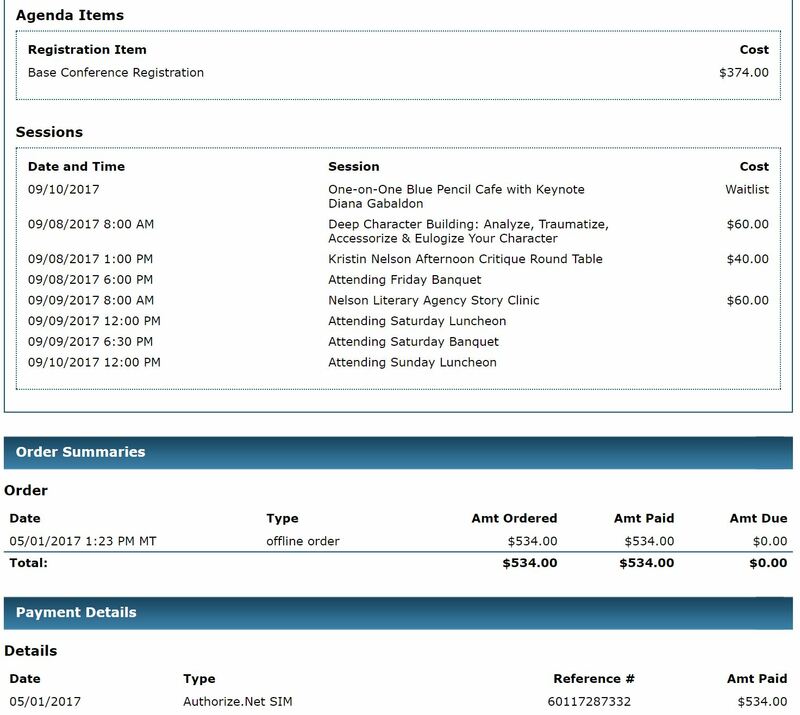 Here’s a breakdown of the conference costs. I paid, as you can see, $534 total. That was with the Early Bird special. I expect to pay another $400 for the hotels, split in half since I’m sharing a room with a friend. 🙂 Plus food (maybe $100). Plus, I fly for free, so there’s another couple hundred I’ll be saving. Have you attended a conference? Let me know in the comments below! I'd love to hear about your experience! !